OMIGOODNESS! OMIGOODNESS! The Fresh Market on Lakeshore Drive opened this week! Haven’t you heard??? Honestly, this is actually big news for many folks who live and/or work in Homewood, Alabama. I work in Homewood, so I’m celebrating this new addition to the neighborhood. I decided to go by Thursday to pick up lunch and it was absolutely NUTS. In a good way. And…well, in a chaotic panini confusion kind of way too. 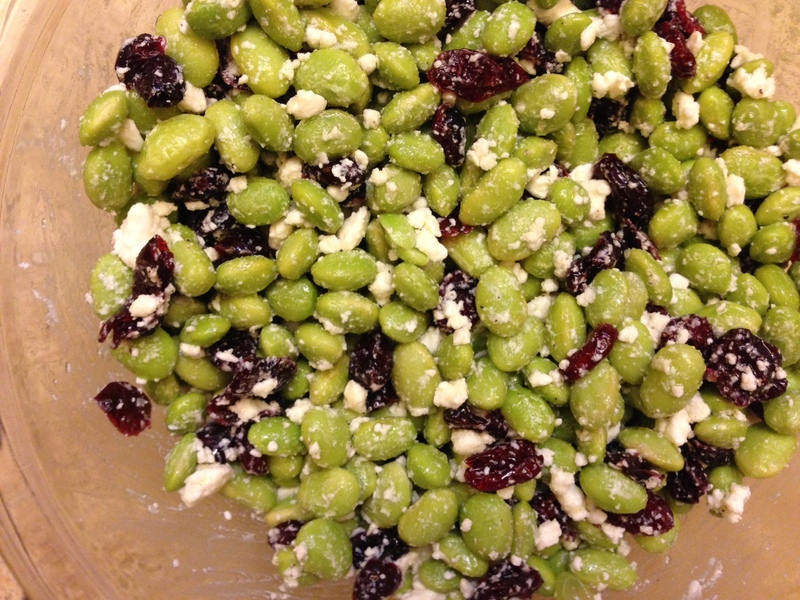 Anyway– as I was standing in line waiting on my panini (now known as the 2013 Panini Debacle), I saw a delicious looking concoction of edamame, cranberry, and feta cheese. It was staring at me. I stared back. Then I ordered some. It was delicious. I ate the entire half-pound order in record time, so I decided to make a big batch this weekend. I had a big ‘ol bag of shelled edamame in my freezer, so I just emptied the package in boiling, salted water and cooked for 6-8 minutes. Then I drained it and let it cool. Next up? Added a cup (or so) of cranberries to a bowl and a cup (okay, maybe more than a cup) of feta cheese. Then I added the cooled edamame, some olive oil, salt, and pepper. It was super easy. I just tossed together and put it in the fridge to let the edamame, cranberries, and feta get to know each other. Super easy. Crazy good. Now I have a side salad for my lunches all week. A big thank you to Fresh Market for: (1) opening its doors (2) the salad inspiration. I’m sure I will see The Fresh Market again very soon.